In this article we review the top 10 best floor standing speakers of 2018 that outperform the rest in terms of price, audio performance, complexity and design, and come highly recommended for audiophiles. These speakers deliver hands down the best sound performance for your home theatre/listening needs without the hefty price tag and are extraordinarily value for money. All of these floor standing speakers are high quality and individually constructed for high volume output, crisp clear sound reproduction and solid bass response to spice up your home audio. Furthermore, some of these best floor standing speakers are selling at great bargain prices at the time of writing, so don’t forget to check them out! The Polk Audio T50s are a set of beautifully crafted floor standing speakers that we thoroughly enjoyed listening to. The T-Series speakers by Polk features premium acoustics, quality construction, easy setup and is now selling at an amazing price point. The T-Series high efficiency design is compatible with most home theatre AV receivers – it’s 1” silk dome dynamic balance wave guide tweeter provides transparent crystal clear treble, with the 6.5” extended throw composite Dynamic Balance Drivers provide open, uncoloured midrange and punchy bass. It also features two 6.5” mass loaded composite sub bass radiators for bass output and low frequencies. Taken as a whole, the Polk T50s are well and truly some of the best floor standing speakers you can find at a very good price that deliver exceptional value for money. Our first impressions were that the T50s are well built, very stable and good looking – it easily blends in together with the home theatre setup. The grills on the speakers can be removed and put back at any time; the T50s have a closed frame which means that they don’t have holes in the back or front. In terms of design, they have a nice black wood grain finish and are solidly constructed speakers. The T50s are nice for a family room or in general for apartments and blends in easily. The T50s provide very clear, crisp and accurate sound reproduction which is pleasing to listen to. 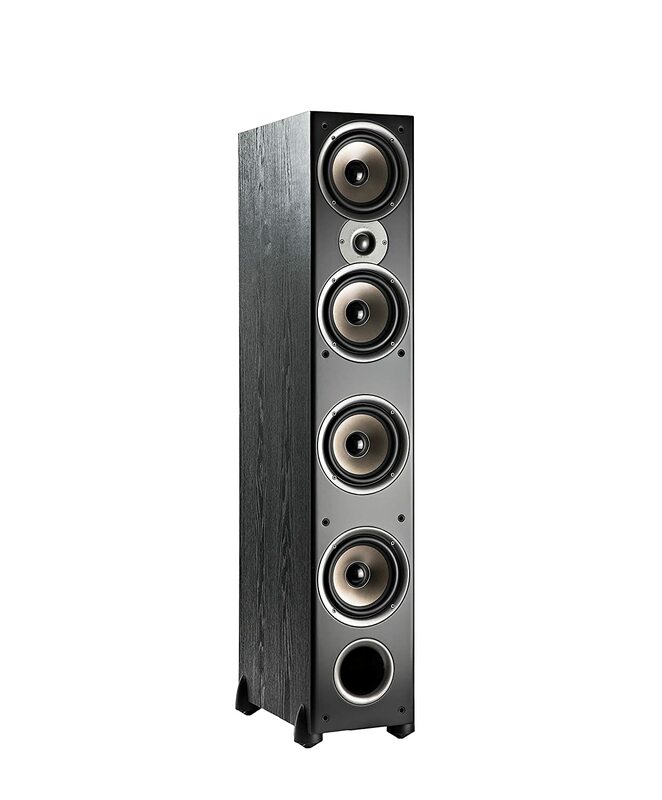 The T50s are waist high and elegantly designed in a tower style. They are extremely simple to connect to your receiver (typical wire connections) and once they have been hooked up, you will immediately notice a difference in overall sound quality. For setup, you will need to wire the speakers to a receiver but there is no need for an independent power source beyond that. We tested these speakers as front channels in a home theatre system without a subwoofer or center channel speaker. In terms of sound performance, the T50s provide clean sound from both tweeters and the bass radiators – they produce full clear sound without a subwoofer. Although some have recommended a subwoofer to achieve a full dynamic range, we found the bass range quite satisfactory. They strike a great balance between full sound and floor thumping sound. When paired with other speakers, we really liked the enhanced soundstage that the T50s bring to the home theatre set-up. These are great speakers with a sound output that surpasses their more expensive counterparts, and yet continues to deliver smooth highs and mids without distortion at high volumes. At this incredible price point, the Polk T50s are pretty much a steal and some of the very best floor standing speakers that money can buy. You are basically getting great audio guaranteed from Polk at a very decent price and you would be hard pressed to find anything wrong with these speakers. With the 1-inch silk dome tweeter, one 6.25-inch extended throw composite driver, and two performance tuned front-firing sub bass radiators—all engineered with Polk’s proprietary Dynamic Balance technology— the T50s are undoubtedly some of the best floor standing speakers on the market and we highly recommend them. 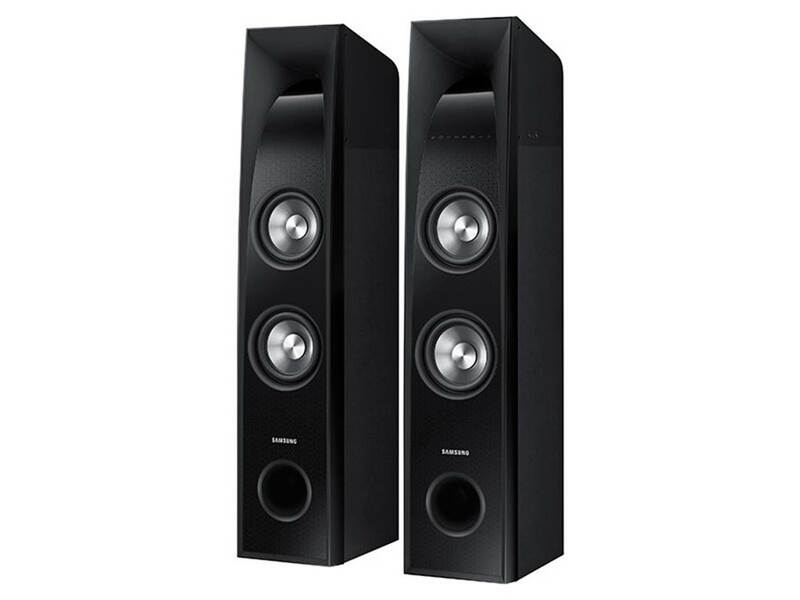 The Sony SSCS3s are some of the best floor standing speakers you can find now selling at a very good price. Each floor standing speaker features a 3-way, 4-speaker bass reflex system with a 5-1/4” foamed mica reinforced woofer and a 1” polyester main tweeter for wide dispersion sound performance. The mica-reinforced drivers are designed to deliver high fidelity sound performance, with the bottom layer of the driver diaphragm delivering enhanced bass response. It also comes with a ¾” Sony super tweeter for immersive sound staging – the super tweeter is specially designed to deliver ultra-responsive, high-frequency audio response up to 50kHz for high resolution audio. The Sony SSCS3s are some of the best floor standing speakers you can buy that really delivers on sound quality and performance. The sound quality from these speakers is very good, with crisp highs, detailed midrange and a good amount of bass. The crossover design on these speakers is very efficient and comes with built-in micro reinforced drivers that produce high-fidelity sound. The Sony speakers also come with a wide-dispersion super tweeter that can deliver a wide frequency response up to 50kHz. Vocal performances on this speaker sounded natural and nearly life-like, and you can really pick up the details in the music such as subtle instrumental notes with these speakers. These floor standing speakers also have a good deal of soundstage and music separation which gives a good sense of space while listening to these speakers; live concert recordings will definitely sound much more detailed and well defined with the Sony SSCS3s. If you are looking for one of the best floor standing speakers at a good budget price, the Sony SSCS3s are definitely worth checking out. The Samsung TW-J5500s are some of the best floor standing speakers you can find at a very good price that deliver phenomenally good sound performance. These speakers deliver high quality audio through its 2.2-channel audio with horn tweeters and ported woofers to offer clear highs and deep bass response. It also features Bluetooth connectivity which allows you to instantly connect to your smartphone, tablet or computer to stream digital music, while the TV Sound Connect feature allows you to connect wireless to your TV without any wiring. It also comes with HDMI and auxiliary input jacks to allow you to connect all non-wireless music sources to the speaker. The speakers have a wattage of 350Ws which is really an incredible amount of power, and work perfectly to complement home theater setups or for quality music listening. They have an elegant and sleek design which blends in easily into home décor while maintaining a very clean and aesthetic look. The TW-J5500s are hands down some of the best floor standing speakers you can find so don’t forget to check them out! The sound performance of the TW-J5500s is incredible and will take almost anything that you throw at it really well. The amazing thing about these floor standing speakers is that they can connect instantly to any Bluetooth music source, and you can get it up and running by streaming music through your smartphones to this speaker. The Bluetooth pairing takes a couple of seconds to get it sorted out and you can start streaming music. The sound performance of the TW-J5500s is very good and has crisp highs, very detailed midrange and decenbt bass response. We tested these speakers with classic rock, electronic dance music, pop and R&B music and you can really feel the detailed sound clarity with this setup. The horn tweeters do a very good job of reproducing high-fidelity audio and you can really catch the subtle details in the music with these speakers. The integrated mid-bass woofer in these speakers does produce very good bass response which hits surprisingly hard, giving your music that extra kick. The J5500s are capable of going very loud without much distortion – it is rated at 350Ws which means you have plenty of power to set up a home theater or play music on full blast – something that will definitely annoy your neighbors. The Samsung J5500s look really sleek and well-designed straight out of the box, with high quality cabinets that reduce sound resonance and vibrations. They sit firmly on the ground without moving an inch when playing music through these speakers. We really liked the fact that these speakers came with a remote control and battery which you can use to control the speaker settings and volume. The Bluetooth streaming on these speakers was really convenient and you can simply turn these speakers on and stream music wirelessly through your mobile device. The J5500s also comes with HDMI inputs to connect directly with your TV receiver for digital sound and video. They also come with optical inputs and auxiliary inputs which may be useful if you want to connect your computer or non-wireless music source to this speaker. The speaker’s dynamic 2.2-channel sound, horn tweeters and ported woofers does the job of producing crystal clear sound very well without static interference or noise at higher volumes; we would recommend playing music through the cable wiring for the best audio quality. The Samsung TW-J5500s are some of the best floor standing speakers you can find that delivers sublime sound performance. The combination of its 2.2-channel audio with horn tweeters and ported woofers makes these speakers capable of delivering rich, room filling sound that feels smooth and detailed. The highs and midrange on these speakers are incredibly well defined, with a good deal of bass response from its integrated bass ports. We particularly liked the fact that you can stream music to these speakers via Bluetooth directly from your smartphone, which makes these speakers very easy to operate. It also comes with HDMI inputs and auxiliary input jacks for you to connect the speakers to non-wireless music sources. The entire speaker has a very sleek and modern design that blends easily into home décor; it comes with durable high quality cabinets that reduces sound resonance and is built to minimise vibrations from large volume outputs. The speakers are rated at 350Ws which make these some of the best floor standing speakers you can find in its category, and we highly recommend them. If you are looking for a set of superb floor standing speakers that are more advanced and high powered than the Polk T50s, the Polk Audio Monitor 70 Series II will blow you away with its incredible sound performance, although at a slightly more expensive price point. In our view, these speakers are simply the best floor standing speakers in the Polk Audio line and we couldn’t believe the difference the extra watts of power made when powering these speakers. The M70s are simply a cut above the rest and really deliver good quality sound performance on a budget, so don’t forget to check it out. If you are a person who enjoys listening to different genres of music you will love these set of speakers because of the amount of life and clarity they bring. We found ourselves re-listening to country, disco and jazz music and they sound like we have never heard them before. You will hear nuances and sounds that you could never have thought were there before. In short, the music sounds exceptionally good – the bass is deep and clean. Although you may wish to attach a subwoofer to the M70s, we felt that no sub was necessary. The M70s exceeded our expectations by providing excellent sound with a beautifully crafted quality construction. The sound quality of the Polk M70s is unbelievable and its hands down one of the best floor standing speakers of 2018 you can find in terms of audio performance. Not only do they produce awesome sound, with top-notch highs and mids, they will literally make you fall in love with your music again. The bass is good and not the earth shattering type, which is pleasant and nice to listen to. We really liked the multiple small-diameter driver design which delivers wide dispersion for an open, “box-less” three-dimensional sound which makes your movies and soundtracks come to life. In sum, the M70s are probably one of the best investments you can make for your home theatre system and we can safely say that this would be one of the best investments you can make for your home audio without any regrets. If you are looking for a set of floor standing speakers for your home theater, the Boston Acoustics Classic II CS260s are some of the best floor standing speakers you can find at an affordable price with exceptional sound. The CS260 II is outfitted with Boston Acoustics’ best audio technologies. The speaker itself is engineered with meticulous attention to detail – the polymer woofers are injected with graphite, allowing it to produce a more resonant bass sound without bottoming out. The Kortec tweeters feature a soft-dome design and have been treated with a stiffening agent to eliminate the high-frequency feedback that usually accompanies metal tweeters. Together, the tweeters and woofers are able to reproduce frequencies ranging from 80 Hz to 25 KHz which ensures consistency in sound quality throughout your music and movies. Furthermore, the CS260s are equipped with gold-plated (five-way) binding posts to preserve signal transfer, minimize frequency losses and gaps in your music. Straight out of the box the CS260s looked extremely pleasing with a stylish wooden finish. Boston Acoustics are able to provide two finish options (i.e., black walnut) – each complements a variety of furniture styles to blend into your living room space. It also features a traditional wooden cabinet to give it a classic balanced aesthetic. They are cosmetically appealing (they are much deeper than they are wide) and blend easily into the room. The speaker’s wide base allows it to stand upright on the floor securely, and the speakers are designed for quick and flexible installation. In terms of sound performance, the CS260s produce very clean sound with crisp highs and impactful bass. A pair of these floor standing speakers produce clear mid-range, a splendid bass drum, and are very good for instrumental music as well as ensembles. The cellos and basses are quite realistic and the lower register sound blends seamlessly with a subwoofer. The CS260s are very true and don’t try to camouflage the sound or pump up certain levels – they sound great with no EQ or before you adjust the sound settings for your space. From classical music to pop and classic rock, these speakers simply sound amazing. When we tested these speakers, we found that they could provide as much low-end as needed without sacrificing the clarity of the mids and highs. On the whole, we were extremely pleased with the CS260s on a basic but robust stereo amplifier. The frequency response is decent, the dynamics are there, resolution, space and imaging are surprisingly exceptional. We really liked the tight mids and high ends that come from these speakers, and they pair really well home theater setups and with a powered sub to provide that extra bass boost where required. 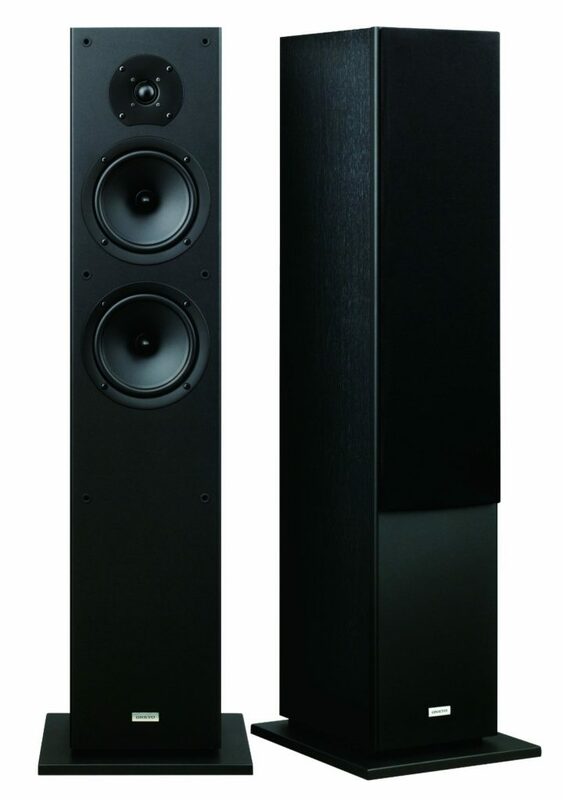 The Boston Acoustics CS260s are high quality, tight sounding speakers that sound more expensive than they really are. They are some of the best floor standing speakers you can get at a good price and for the best quality. These speakers are crisp, clean and impactful sounding; we really liked their sound performance especially on the tight mids and high ends, giving a depth to the music and soundstage that exceeded our expectations. They are beautifully crafted and look gorgeous from the front angle, and blends in easily with your other stereo speakers. 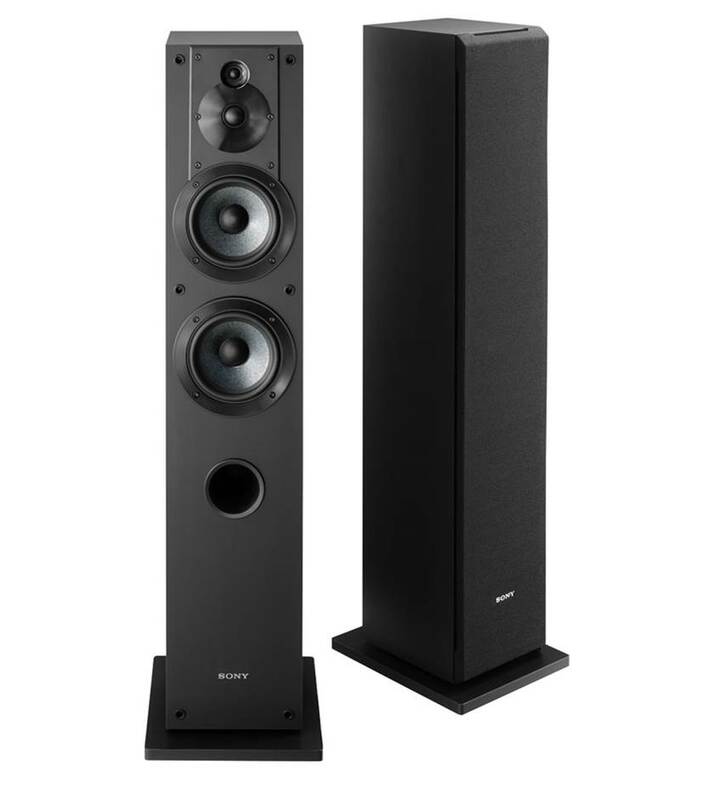 At this price range, the CS260s are well and truly some of the best floor standing speakers you can find in its category. 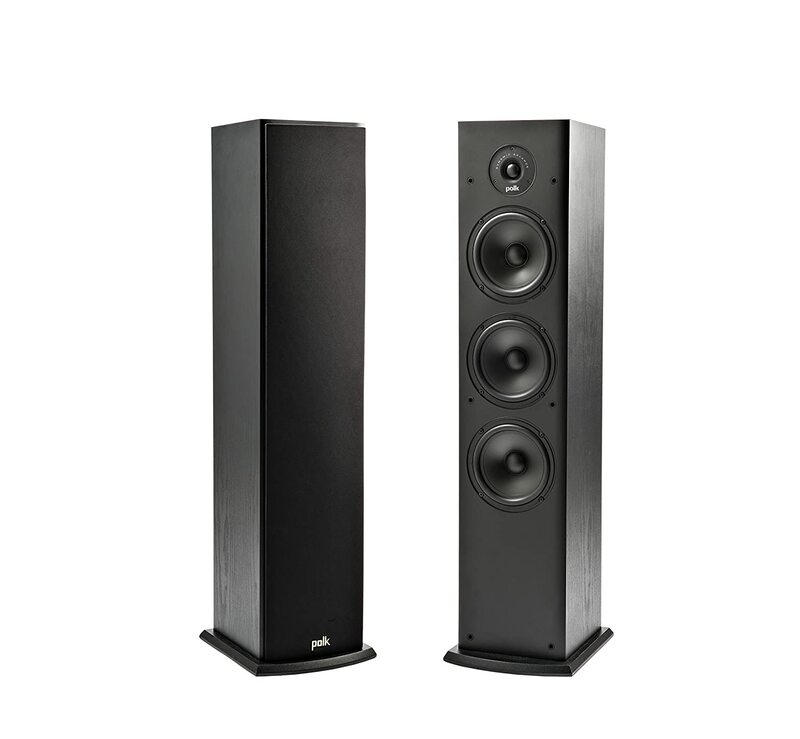 The Definitive Technology BP-8020STs are some of the most sophisticated and best floor standing speakers you can find in the market, selling at an incredible price point at the time of writing. 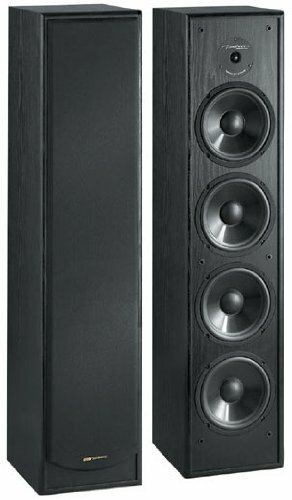 The BP-8020STs are a third generation of the BP SuperTower series by Definitive Technology and uses a bipolar speaker design array to produce rich life-like, room-filling, three-dimensional sound. The BP-8020STs feature a built in 150 watt powered subwoofer which delivers impactful bass and eliminates the need for a separate subwoofer for your home theater system. It also has three 3-1/2” midrange drivers for life-like tonal balance and broad dispersion that increases depth to the soundstage. It’s truly one of the best floor standing speakers of 2018 that deserve special mention. We really liked the design of the BP-8020STs – the entire speaker is housed in a slim enclosure taking less than 1 sq ft of floor space. Each speaker incorporates two sets of drivers – one facing forward and the other facing to the rear, so that the speakers radiate sound both forward and rearward, just as sound is reproduced naturally in real life. The original Bipolar design provides you with a lifelike balance of early-arrival sound from the front facing drivers and reflected delayed sound from the rear drivers for a three dimensional soundstage. In short, this combination creates a nice soundfield which makes your movies come to life – you will hear things in the movies that you never thought existed, such as the aftershock of a grenade explosion with the debris falling. We particularly liked the fact that this floor standing speaker came with an integrated 8” subwoofer. The 150-watt Class D amplifier provides an impactful bass response and produces near-earth-shattering bass like qualities. It also helps to save space especially if your theater setup lacks the space for a dedicated subwoofer. Using two BP-8020STs will produce high impact bass throughout the room that feels deep and authoritative. The BP-8020STs shines in terms of sound performance – it has tight punchy bass combined with great mids and highs. We were surprised that these floor standing speakers could reach the same lows as a dedicated sub. The sound has a warm signature and is very pleasant to listen to with classical genres. One consideration is that these speakers will fire sound to the rear and to the sides, so it will need some space from the walls (we recommend the speaker placement to be 2 feet or more from the wall). Due to the bi-polar design of the speaker the soundstage is wide and actually wraps around you. These speakers with your home theater setup will really blow you away with how good they sound when watching movies. The Definitive Technology BP-8020STs, with its sophisticated bipolar design and dedicated subwoofer is one of the best floor standing speakers for home theater and to enjoy your movies on the go. Listening to uncompressed music with this speakers is simply a joy. If you are a movie “bass” fanatic and want the best floor standing speakers with bass, the BP-8020STs will definitely come in handy with their integrated sub, eliminating the need for you to get another dedicated subwoofer and occupy more space. If you are looking for a ton of bass and clear vocals, you really cannot go wrong with these speakers. At the time of writing, these best floor standing speakers are now selling at a very good price point, so don’t forget to check them out! The Klipsch RF-82 II Reference Series speakers are some of the best floor standing speakers in the Klipsch line of products that deliver phenomenal sound performance. The Reference II speakers are fifth generation speakers with even more content and superior sound quality. They feature re-engineered drivers throughout combined with a new crossover system reproduces sound naturally and efficiently. The rigid cera-metallic woofer cones with specially treated aluminium to better dampen and prevent distortion. It also features titanium tweeters with linear travel suspension which provides an open, natural sound, making you feel as though you are in the studio or in the movie itself. The speaker itself is aesthetically appealing – the cabinet of the RF-82 is slimmer and less protrusive, with a sophisticated look with new cooper accents. At the time of writing, these best floor standing speakers deliver great sound quality and are highly value for money, so don’t forget to check them out! The sound performance of the RF-82 II reference series exceeded our expectations. They sounded great with any equalizer settings, although you can increase the lowest bass and highest treble on the EQ settings to provide richer mids and a touch more heavy lows in the mix. The titanium drivers sound incredible – highs are crisp and flat, yet full. The mid-range (which comprises a mix of horn and woofer output) is just as incredible – the sound rich and full sounding. We really enjoyed the lows and the ported woofers from these speakers, which produced rich, tight lows from drum beats or while watching movie action scenes. 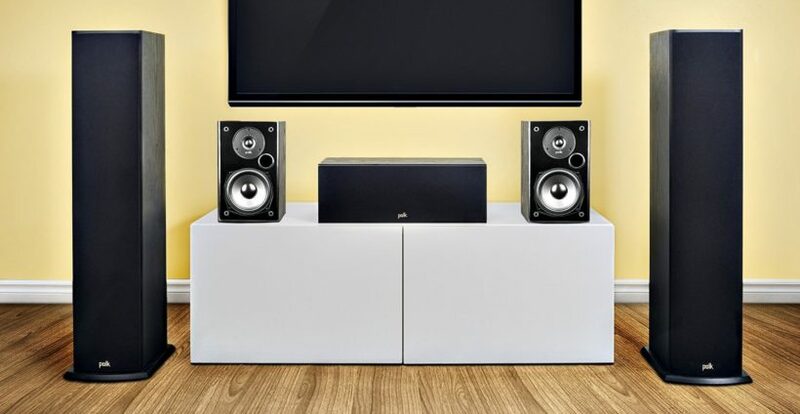 When the RF-82 IIs are connected to the home theater system they enhance the highs and mid-ranges pretty well, and produce good response and full sound with its dedicated woofer suspension system. Setting up the RF-82s are a snap – the speaker comes with good terminal connections. These speakers will require a good dedicated amplifier to drive it, or you would not be able to get the most out of these best floor standing speakers. The higher power handing is very good with no distortion and very crisp highs and mid-ranges, typical with the Klipsch horn drivers. If you find that the low end is slightly limited, this can be offset with proper EQ without the aid of a subwoofer. The addition of a subwoofer, while not necessary, does add an improved low end – you should be careful with the cross over frequency of the sub. The RF-82s are very good at replicating natural sound with incredible soundstage. For example, while watching Batman you can hear the rockets fly past you with the wind blowing and ships landing in the distance, together with all the ambient sounds. Each little explosion from these rockets is heavy and crisp – and you can almost hear every single detail with utmost clarity. It’s hard to describe how pleasing it is to be able to appreciate your movies on another level of detail. 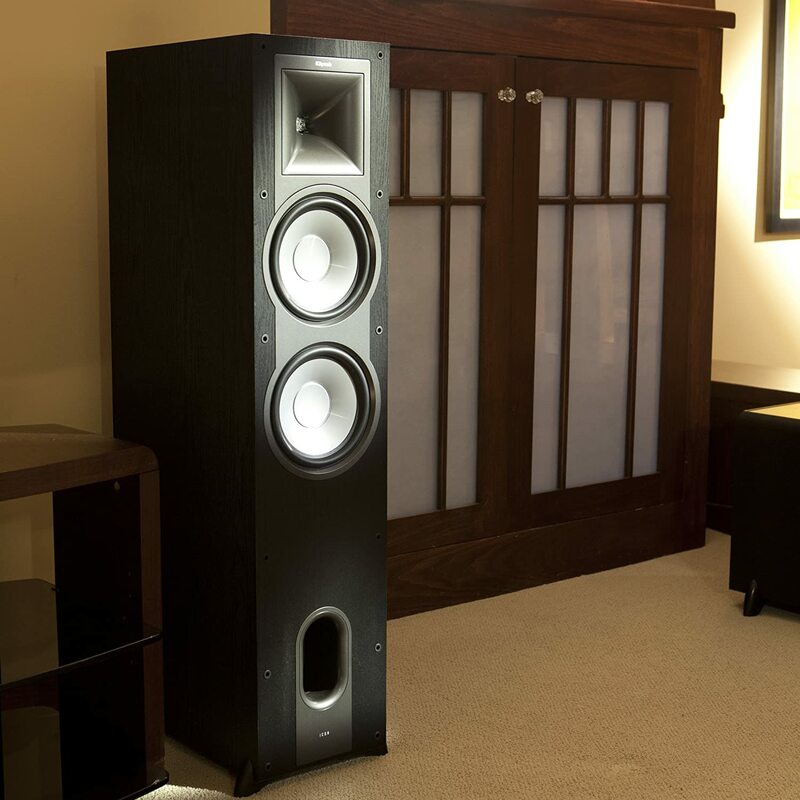 The Klipsch RF-82 speakers are overall some of the best floor standing speakers available on the market. It does a very nice job for vocal reproduction for movies and music as well. We loved the fact that you could hear every single detail of the music with these speakers – and the mids and highs are crisp and clear. These speakers are high-efficiency with low distortion, have a flat frequency response and a wide dynamic range which provides precise sound. The lifelike sound from these speakers are simply phenomenal, coupled with an incredibly large soundstage, makes the RF-82s one of the best floor standing speakers you can expect for home theatre and musical listening. The Onkyo SKF-4800s are specially crafted speakers with integrated twin woofers to produce full and natural music with stunning detail across the audio spectrum. These are some of the best floor standing speakers that will bring energy and full-spectrum power to your home entertainment system. The Onkyo SKF-4800s can be used to complement a stereo system or to build up a surround system by using these as front left and right channel speakers. The twin woofers give them the ability to handle dynamic classical music and rock / pop music with rock solid bass and detailed highs and mids. It also comes with banana plug compatible speaker posts and has a max input power of 130 W. The speaker comes with twin 16 cm cone woofers with 2.5 cm soft-dome tweeters. We were highly impressed with the sound performance of the Onkyo SKF-4800s. We really liked the quality and sound of these speakers – from the great highs and mids, we were surprised at how detailed theses speakers were with regards to music reproduction, and giving an authentic feel and clarity to the sound. We were particularly surprised at how much bass these speakers were giving out – it was good enough that these speakers could easily do without a dedicated subwoofer. The midranges on the Onkyos also seemed very clear without the need for a sub. These speakers delivered precisely the kind of crisply defined sound you would expect from a modern speaker. In short, the Onkyos produce full sound that takes cares of the highs, mids and bass. This is really an all-in-one speaker set which will be convenient if you don’t want to get an additional subwoofer to power your system. We found the treble piercing and long-lasting, the mids are not muddled and individualize the instruments and sounds soft and detailed. The bass has a steady rumble, which is not booming or jarring, and produces an organic beat. The construction quality of the Onkyos is outstanding. 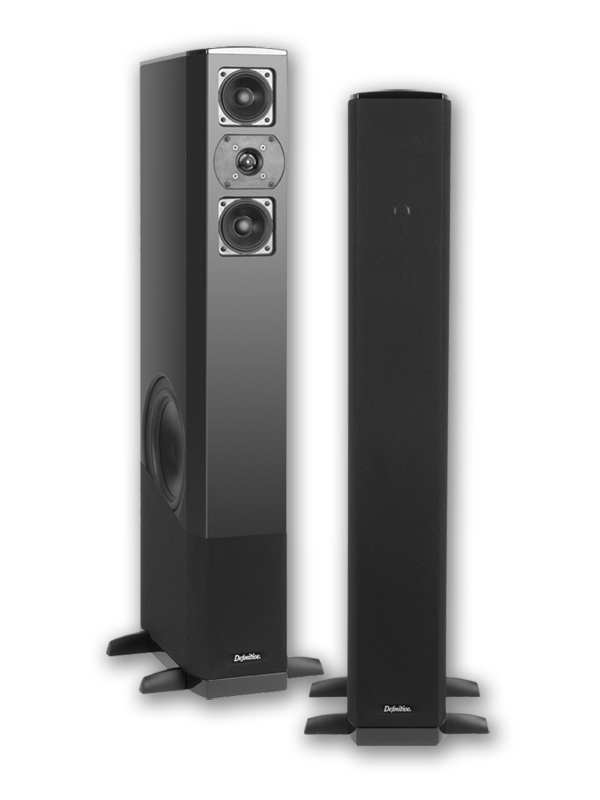 These are very tall (around 40”) and are heavy and solid speakers (the weight in total for both is around 55 ibs or 25 kg). We found the most of the weight was coming from the wood comprising of the cabinet casing for the speaker. The outer casing is wood with a black semi-gloss appearance that is smooth to the touch. Due to the weight, they will be able to stand on the ground securely without tilting or tipping over. The quality of the construction will show when you fully set up these speakers – it will look absolutely gorgeous with the home theater setup. The Onkyos SFK-4800s are some of the best floor standing speakers you can find which exudes high quality of construction, quality highs, mids and lows and a startling amount of bass. Although these speakers are slightly more expensive, you really get quality for what you pay for – you are getting a quality speaker that is worth far more than what the competition can offer at this price range. For beginner or existing home theater or stereo systems, these best floor standing speakers are a fantastic addition to your home audio stage and we highly recommend them. The ELAC Debut F5 are some of the best floor standing speakers with impressive audio quality at a very decent and reasonable price. The F5 itself pays meticulous attention to detail and design – it features silk-dome tweeters with deep custom waveguide technology to improve directional control and shield the dome tweeter from cabinet diffraction modes inherent in traditional box enclosures. The ELAC cabinet is engineered to last a long time with thick MDF outer walls and a luxurious textured vinyl finish. The F5 isolates the tweeter and top woofer from the rest of the cabinet to help minimize standing wave issues. Furthermore, aramid fiber is used in the woofers of all ELAC Debut passive drivers to achieve a broader bandwidth and smoother response. The F5 also has an intricate crossover system to enhance efficiency and minimize distortion. Straight out of the box, we found that the F5 floor standing speakers are beautifully designed. The MDF is a good option and is good enough for most cabinet construction on consumer grade speakers. The hardware is of very good quality and designed to be functional. The binding posts offer several ways for your wire hook-up – there is bare wire, ring terminal, or banana plug and you are good to go. These connections are all gold plated for longevity and good conductivity. The feel and finish of the speaker is great. The sound quality of the F5s are superb and great for a simple stereo setup or a multi-speaker setup, and is an ideal addition to your home theater system as front right and left channels. Once connected to a decent amplifier, you will definitely hear the clear quality sound at normal listening levels, and they sound beautifully rich and clean. We found that the Debut F5 has all the magic qualities we were looking for in the best floor standing speakers – smooth and lush-like synthesizers with powerful presence. The bass was deep and tight and could re-create drum and bass riffs that you could literally feel. The speaker reproduces vocals nicely and it blends smoothly with the instruments. The highs that come from the F5s are smooth and never shrill. The F5s bring out all the details in a recording and do not contribute to listening fatigue after long sessions – listening to these speakers made us feel emerged after a while. These speakers will sound very good straight out of the box, and after a good break-in period they mellow a bit and sound even better. The soundstage was 3D and lifelike, and if you close your eyes while listening to the F5s, the speakers could disappear and you could sense where the musicians were standing in the room which is rather remarkable. We thoroughly enjoyed listening to the ELAC Debut F5s. These speakers reproduce natural rich sound and you will enjoy listening to these speakers for 8 hrs a day without any listening fatigue. These speakers have the ability to reproduce crystal clear sound with crisp highs and mids, without sounding too harsh on the highs. It also brings a great depth to the soundstage and with the correct positioning, you can get life-like music in your home theater setup. Furthermore, the ELAC F5s are available at a very reasonable price – if you are looking for some of the best floor standing speakers that will energise your home theater experience, these speakers are the ones to get. The BIC America Venturi DV64 are some of the best floor standing speakers you can find on a budget, and are designed for high performance in a comprehensive surround sound system. The speaker features dual 6.5-inch poly/graphite woofers and dual passive radiators to ensure impressive mid tones and extra bass extension. The 0.75-inch soft dome tweeter reproduces the high frequencies with confidence, creating a frequency response of 29 Hz to 21 kHz. In addition, the DV64 speaker is powerful enough for replicating cinematic experiences, with a maximum recommend amplifier power of 200 watts and a minimum of 10 watts. 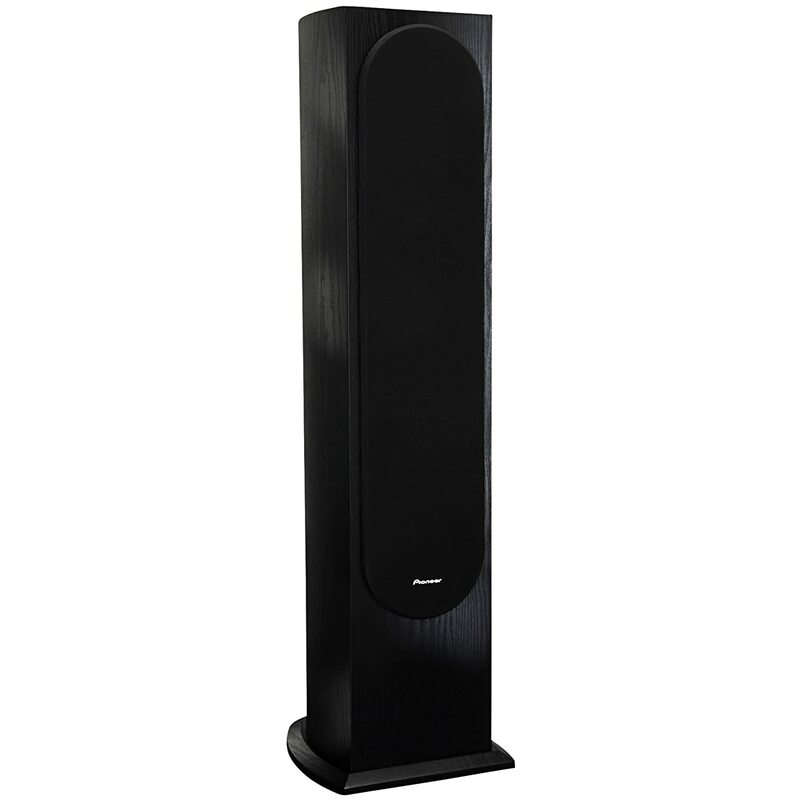 The DV64s are exceptionally well designed, which is topped off by the gracefully tall profile and black laminate finish. The speaker measures 8.5 by 38 by 9.25 inches (W x H x D) and carries a generous seven-year limited warranty. When we first tested the DV64s, we were blown away with the sound quality at such a low price level. These are truly musical speakers and absolutely superb sounding. Though these speakers sound a little “bright” right out of the box, a couple of adjustments at the receiver made the difference. These speakers exceed our expectations all the way around with crisp, punchy and warm smooth bass. The speakers also get better with more playtime (50 hr break in period). The cabinets of the DV64s are very well designed, and feel heavy and solid. The speaker covers are solid and stretched tightly with high quality mesh. The overall appearance of the DV64s is that it looks and feels aesthetically pleasing. We were quite surprised at the sound performance of the DV64s in a home theater setup. The bass response is stunning, the highs are crisp and clean, and it greatly enhanced the overall home theater surround system setup. We ran numerous soundtracks and movies through the setup and we can say that these speakers are one of the best floor standing speakers in terms of value, and one of the best we have heard. That said, we should stress that these speakers must be broken in – the sound performance changes dramatically from the moment you hook them up and after 40-50 hours of music and movies played through them at moderate volume. Once the DV64s were broken in, we could absolutely appreciate the sound of these speakers which made for a much more enjoyable music experience. These speakers produce crystal clear deep bass – the bass is tighter and has more of impactful type sound rather than a boomy sound to it. For example, when watching movies, you can really hear the sound of the cannon or grenade explosion in detail as opposed to one loud “boom”. We were also surprised to hear details and nuances in music and movies that we never knew existed for years. 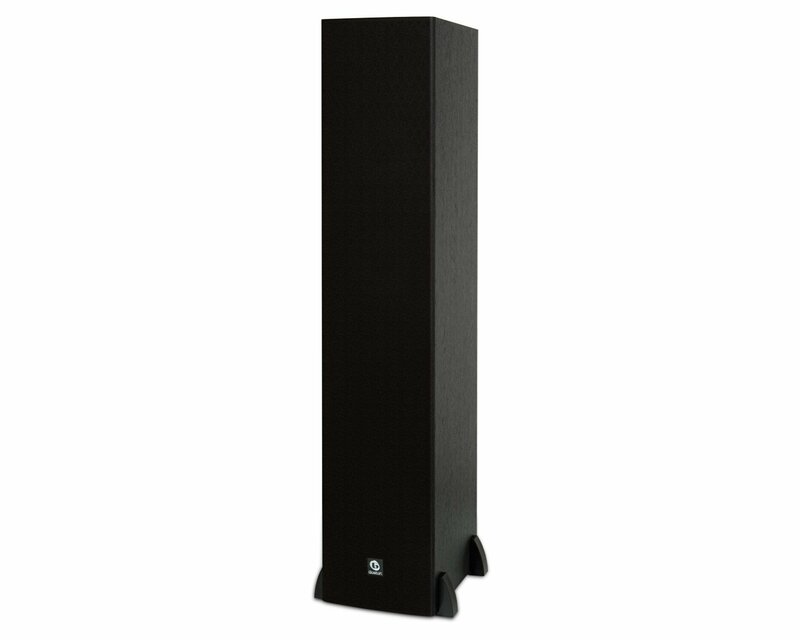 The BIC America DV64s are some of the best floor standing speakers you can expect to get on a budget. These speakers absolutely over-perform way above their price tag, and if you are looking for a cheaper option with the best quality, the DV64s definitely make the cut. These speakers sound amazing, look amazing and are very well constructed and feel very high quality. After a period of burn-in (about 50 hours), you’ll come to appreciate a set of best floor standing speakers that you never knew could deliver such exceptional sound performance. The Klipsch KF-28 is the largest high-performance option in the enhanced Klipsch Icon series and one of the best floor standing speakers in Klipsch’s line of floor speakers. The KF-28s is able to fill medium to large rooms with powerful, lifelike music performance, and its highly efficient design produces more sound output using less energy. This means the KF-28s plays louder with less distortion – you can get fantastic response from these speakers without needing a powerful amp driver hundreds of watts per channel. The Icon series features an enhanced 1” aluminium tweeter, dual 8” high-output woofers which adds a combination of precision, clarity and power. The speaker also comes with Klipsch’s re-engineered drivers combined with a new cross-over system which gives theses speakers a large soundstage with well-defined imaging. In short, KF-28s are some of the finest and best floor standing speakers you can find that does not require a lot of power to drive, but delivers exceptional music performance at a reasonable price tag. 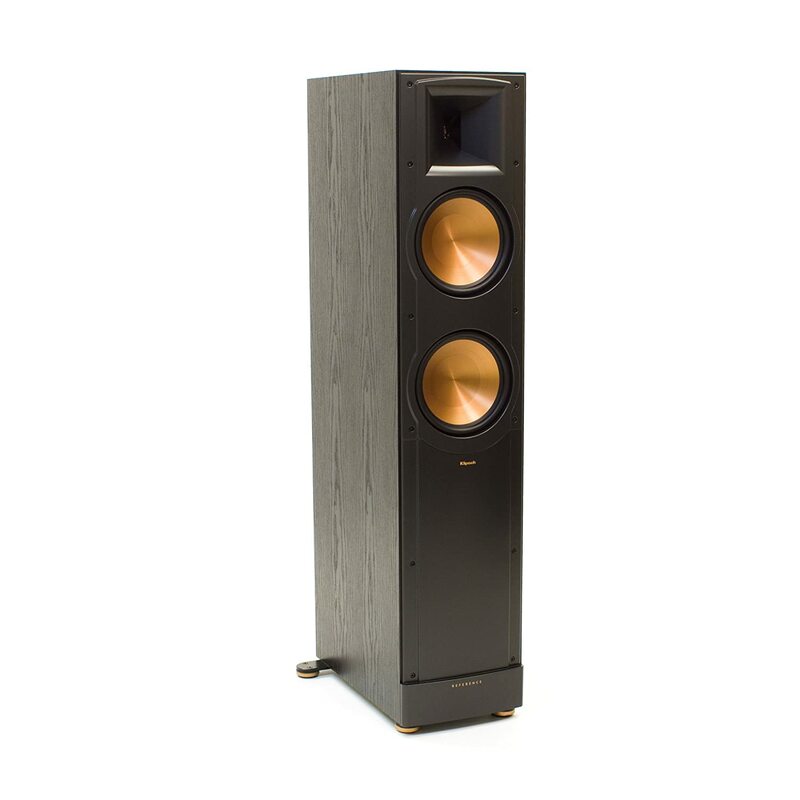 The Klipsch KF-28s are extremely energy efficient with a high sensitivity rating (98 dB per watt). This effectively means that you cannot really get any distortion from these speakers – if you are using what you think might be an underpowered amplifier, these speakers would be a good choice. The design of the KF-28s is stunning and aesthetically appealing. The sound cabinet is well crafted and is designed to minimize fuzz, vibration and distortion, which is vital to any floor speaker setup. The foot of the cabinet has optional rubber pads which can be used if you are putting it on a non-carpeted surface. The sound performance of the KF-28s is fantastic, with a very good high range and great midrange. We particularly enjoyed listening to classical music on these speakers, which made it seem as though we were part of a real life orchestra with the deep soundstage and spatial imaging. The bass response on the KF-28s is good and well balanced – however, if you want an emphasized bass response it would be ideal to get a dedicated subwoofer for this purpose. That said, we felt that the lows when not connected to a subwoofer were very impressive – we certainly do not feel that a subwoofer is necessary with these speakers as the front channels unless you are into earth-shattering bass. When we combined the KF-28s with a good center speaker and a dedicated sub, we were highly impressed by the overall sound performance of these speakers which made the movies feel as though they were taking place in real life. These speakers deliver more sound at lower volume and accurately hit high ranges – voices and vocal performances sounds astounding. You don’t really need additional rear speakers to boost your surround sound experience unless that is what you require for your home theater. The KF-28s excel at home theater and are capable of delivering a wide range of music genres, from hard rock to jazz to classical with precision and clarity. The sound is so clear that the music comes across smoothly regardless of the volume or pitch. It doesn’t even buzz on the bass notes. We were quite blown away by how loud and clear the KF-28s speakers performed – the highs are brought out so much more because of the funnel tweeter and as a result we heard things while watching movies that we had never heard before. Overall, these are some of the best floor standing speakers that are built to last for a long time and we highly recommend them. The Pioneer SP-FS52s are hands down one of the best floor standing speakers you can find that delivers great value for money. These speakers are engineered for high sound quality using a sophisticated crossover network that generates more precise frequency division for your home theatre system. It also features RF Molded Curved Cabinets designed by Andrew Jones to reduce internal standing waves, and three 5-1/4” structured surface woofers with oversized magnets and vented pole pieces for improved bass response. Furthermore, its 1” high efficiency soft dome tweeter produces smooth high frequency reproduction at high volumes without distortion. The complex crossover network blends audio between the woofer and tweeter for greater sound accuracy. All in all, we were highly impressed with the performance of the SP-FS52-LR. We found that with the true curved cabinet design, not only were the SP-FS52 floor standing speakers aesthetically more pleasing, it enhanced the overall listening experience. The high quality and detailed sound output is the result of this stiffer design, which reduces standing sound waves inside the cabinet. To widen the sweet spot of the 1-inch high efficiency soft dome tweeter, Pioneer engineered a custom wave guide that increases tweeter efficiency which allows the SF-FS52s to play louder using less power. We felt that the SP-FS52s does have a lot of bass for such a compact floor standing speaker, which is pretty amazing. The bass is not muddy at all, and very crisp and impactful, which makes these speakers sound all the more beautiful. These speakers easily fill a large room with sound, and can go pretty loud when required. We also liked the elegant and appealing speaker grills on the SP-FS52s which looked very nice, but are also removable if you prefer to see the drivers exposed. In addition, Pioneer has added a structured surface to the 5-1/4-inch woofer. By doing so, not only is rigidity improved, so is bass accuracy. The pole piece is also vented, improving bass response from the same size woofers in previous models. The job of the crossover in a speaker is to break the audio signal into low, high, and sometimes mid-range frequencies. It’s an important job, and it uses circuitry like inductors and capacitors to accomplish it. Most speakers use an extremely simple, low-cost crossover made up of a single capacitor and inductor. The Pioneer SP-FS52 utilizes a sophisticated 8-component, high-quality crossover to provide high quality sound that makes its presence known. The sound performance of the SP-FS52s is definitely something to be reckoned with. We thoroughly enjoyed the highs of these Pioneers’ which are very, very smooth. While the DAC that you use (in your receiver amp or external box) will affect the extent of “digital harshness” associated with digital music, the Pioneer speakers are very forgiving on digital music. The Pioneers eliminate much of the digital harshness because the highs on these speakers are very smooth. Furthermore, these speakers produce very tight and musical performance – the bass is not bloated or muddy. Although the bass level is not of the “deep-reaching” kind that you use for movies (the type of bass that will rattle you during movie scenes), you will love these floor standing speakers if you want a nice musical speaker that will blend with your overall speaker system. Finally, we were simply blown away with the performance of the SP-FS52s on instrumental soundtracks. Without breaking in these speakers, we could already hear the string and wind instruments sound like they sound, and the width and depth of the soundstage is incredible. The SP-FS52s are hands down one of the best floor standing speakers you can find on a budget – and are highly value for money. For the vast majority of people, even budget audiophiles, these speakers are something that they will be extremely happy with for a long time. These are very beautifully crafted speakers and designed to blend into your home theatre system, and providing an incredible depth to your overall soundstage. It’s one of the best floor standing speakers of 2018 and we highly recommend them. The JBL L880s are extraordinary and some of the best floor standing speakers we have ever tested. Although slightly higher on the price range, these floor standing speakers literally blew us away with its incredible sound performance and depth of soundstage. The L880s are fitted with a 1” pure titanium dome tweeter for exceptionally high frequency performance, with aluminium waveguides to provide better dispersion and a larger listening sweet spot. It also has gold-plated, 5-way bi-wirable binding posts and features freeflow port technology to deliver great sound and reduce distortion. It’s hands down one of the best floor standing speakers in terms of its ability to reproduce music exactly how the musicians and artists intended – what you are getting is pure authority with these incredible speakers. The L880s response curves are flat on the axis from 40KHz down to about 30 Hz, which means that everything literally sounds exactly as the mixer, engineers and musicians (or movie makers) intended it to sound. The music has a great sense of clarity and depth to it – nothing is being unduly influenced by characteristics of the speakers themselves, and it comes off as refined and neutral. If you are into stereo listening, the L880s will get you hooked again with their superb clarity and soundstage. The L880s are excellent speakers for both music and movies, and their musicality is exceptionally good. When paired with your home theater system, they produce rich, full bass with strong mids and crisp highs with great ease. If you push them, these speakers will not distort – they simply go louder and louder until your amplifier gets to its limits. The sound from the L880s is well defined and is perfect for cinematic sound, and really made the movies come to life. The depth and authority of these floor standing speakers was simply nothing like we have ever seen before. The sound reproduction is simply phenomenal. In terms of design, the JBL L880s are very nice looking in cherry finish (available in different finishes). It gives a great punch and dynamic to watch movies and provides plenty of headroom for further amplification. We really liked the fact that the speaker features nice interconnections and relatively undetectable crossovers. That said, these speakers come rather large at 14.8 x 8.8 x 39 inches. If you have enough space for your home theatre setup then it’s no issue at all (the bigger the better). 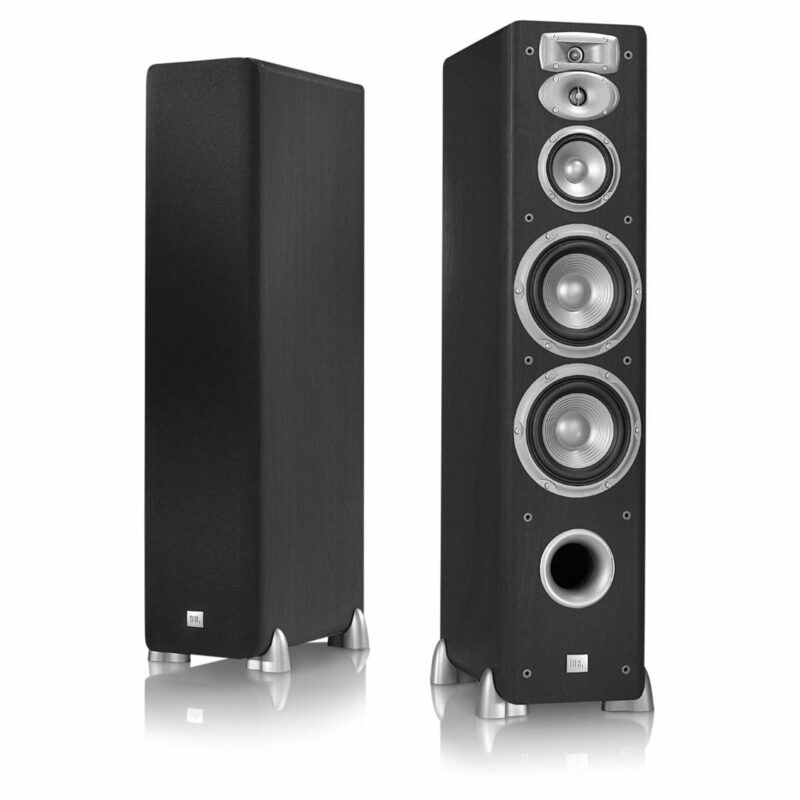 The JBL L880s are hands down amazing value for money and one of the best floor standing speakers you can ever buy. Although this is slightly more expensive than the other floor standing speakers on this list, you really get quality for every dollar spent. These speakers are great for home theater applications, but are even better for music listening in 2 channel or multi-channel setups. Instead of getting more expensive brands at boutique audio stores, the JBL L880s will definitely give you a run for your money at least 3-4 times the price with the right amplification and we say this will blow everything else you have heard into the water. Overall, we would recommend these best floor standing speakers without hesitation – they look and sound great and are worth every penny.